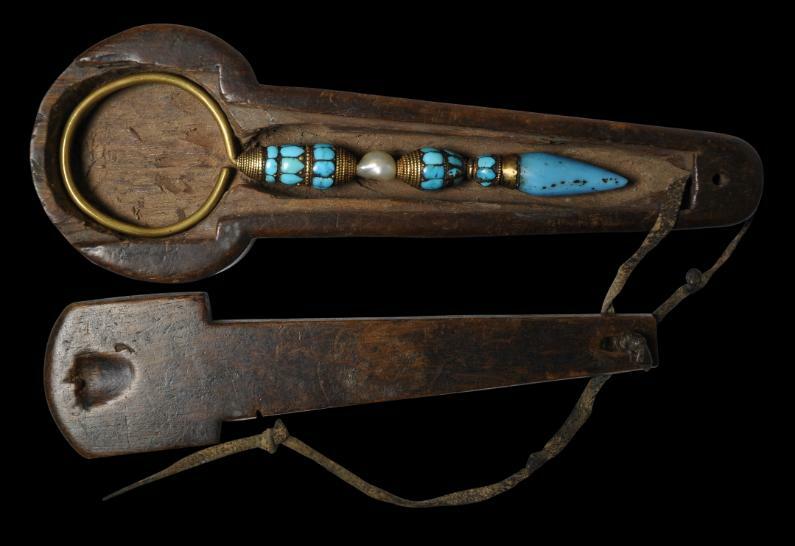 This thin, pencil-like ear ornament known as a sochi is made from twisted gold and pearled wire, gold sheet, a single baroque pearl, turquoise pieces, and a long turquoise-coloured glass drop. 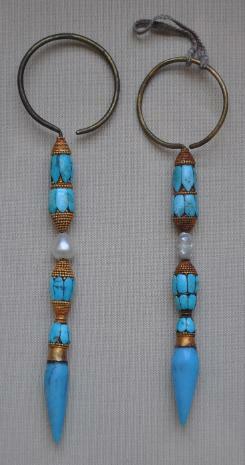 Such pendants were worn from the left ear as a badge of office by Tibetan government ministers and officials. The gold hoop at the top of the pendant fitted through the pierced ear but the weight of the pendant usually was supported by a thin strip of silk textile that was attached to the hoop and which fitted over the ear. The example here retains its original wooden box which has a sliding cover which is pulled in and out by the original leather strap. The box has a superb patina and obvious age; its contours having been rounded and softened by years of handling. See Casey Singer (1996, p. 100-1), Clarke (2004, p. 65) and Reynolds (1978, p. 46) for illustrated examples. Two examples currently are displayed in the British Museum. See Borel (1994, p. 169) for another related example. 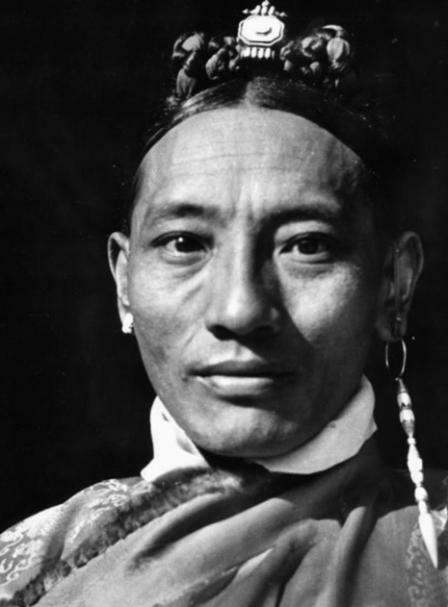 The example here is for a government official but Borel relates a Tibetan superstition that whoever wears no earring is likely to be reincarnated as a donkey. The ear pendant and box are in very fine condition. Gold Jewelry from Tibet and Nepal, Thames & Hudson, 1996. Jewellery of Tibet and the Himalayas, V&A Publications, 2004.